Casa Scimone lies in the upper part of Taormina in a panoramic position with a view of the whole of the gulf. It isn't easy to describe Casa Scimone and in fact its arrangement is so unusual that we can only describe it properly by starting from the access road and continuing from there. 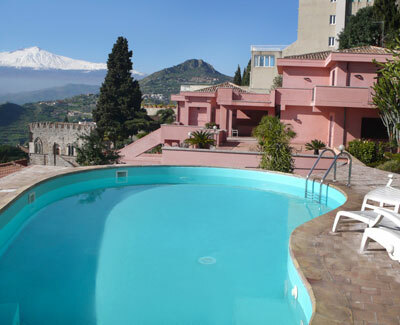 It lies in the upper part of Taormina in a panoramic position with a view of the whole of the gulf, the coast of Giardini Naxos and then all the way to Etna where you can see the summit perfectly clearly. An automatic gate gives access to the parking area of the property which you enter up some flights of steps or in the more convenient lift. On the first level you come to Casa Micaela which has a large panoramic terrace embellished with plants and flowers and relaxation areas; then on the second floor is Casa Dario, where a large, paved terraced area leads to the swimming-pool area, made in a raised sector from which you can take in the whole of the panorama of the sea; then going up some stairs you go through a rocky garden leading up the hill, and which also has a splendid view. Next to Casa Dario is the area furnished for dining outside. All of the property is furnished with modern furniture by a well-known designer, and the equipment is all of high-quality: air-conditioning and heating in all the rooms, satellite-TV, cable radio, stereo with CD player. The town of Taormina is near enough to go down on foot, and the beach at Mazzarò can be reached either by car or by the convenient cable car that starts from the centre of the town. Taormina has several prestigious cultural events throughout the year at the Teatro Greco, the second of two classical theatres in Sicily after the one at Syracuse.